In Barry at the The Paper’s office and the Barry Public Library. In Pittsfield at Casteel’s, Bloomers, and the William Watson Hotel. D. W. Ensign, Atlas Map of Pike County, Illinois. Andreas, Lyter & Co., Davenport, Iowa, 1872. Charles C.Chapman, History of Pike County, Illinois. Charles C. Chapman & Co., Chicago, Illinois, 1880. 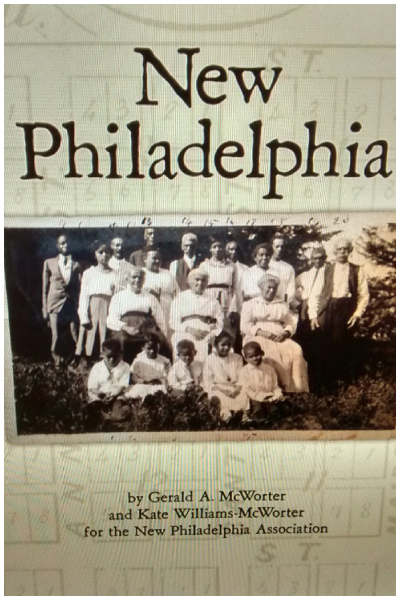 Helen McWorter Simpson, Makers of History. Laddie B. Warren, Evansville, Indiana, 1981. 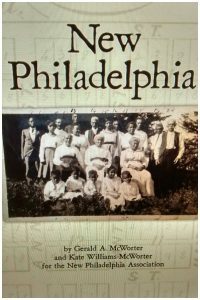 Grace E. Matteson, “Free Frank” McWorter and the “Ghost Town” of New Philadelphia. Pike County Historical Society, Pittsfield, 1964. Juliet E. K. Walker, Free Frank: A Black Pioneer on the Antebellum Frontier. University Press of Kentucky, Lexington, 1983 (reissue edition 1995). Paul A. Shackel, New Philadelphia: An Archaeology of Race in the Heartland. University of California Press, Berkeley, 2010.